It’s June. It’s 100 degrees. You walk in from the sweltering parking lot to the coolness of your local grocery store. You were only in the car for three minutes, but your back is sweaty, your flip flops are like hot tin shingles on your feet, and you wish to plunge your entire self into a mountain river. You grab a cart, pull out your list, and suddenly stop. Because there, right in front of you, practically blocking the whole produce aisle, is a giant cardboard box brimming over with ripe, juicy watermelons. You think, “Mmmm, what could be better than watermelon today?” Nothing. Absolutely nothing. It’s $6.99 per watermelon, so you pick the biggest one you can find and heave-ho it into your cart. You take it home, get out your biggest knife, slice into it, and eat it. For three days. And then you still have half of it left. Your family will have nothing more to do with it. You even take it to a cookout; you and three other women bring watermelon to the cookout. Let’s face it: watermelons are just too big. They are tempting and delicious and bring summer to our mouths, but they are huge. So what do you do with all that leftover watermelon? Here are my discoveries from the last two weeks. First, put on some music. Then, chop up all that watermelon into chunks and get rid of the seeds. 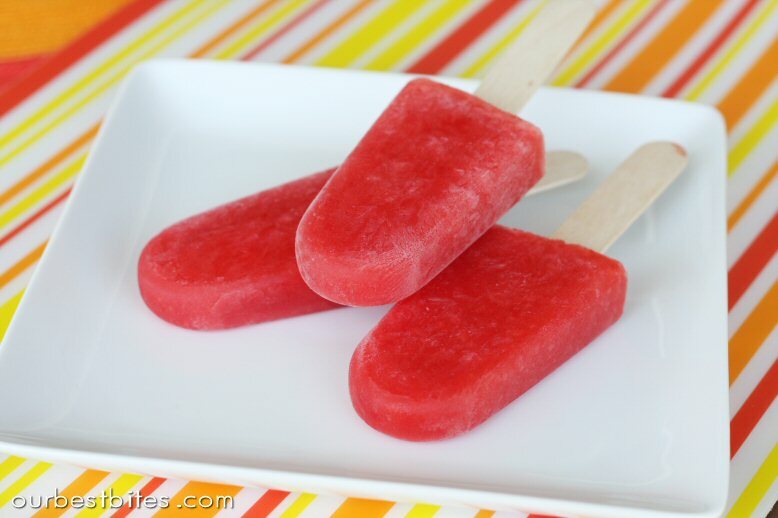 Next, find a good watermelon popsicle recipe. I used this recipe and it was delicious. I didn’t have the light corn syrup it called for, so I used honey instead. Also, I only used 2 Tablespoons of sugar instead of the six it called for, because good grief, people, it’s already sweet. My husband said he didn’t enjoy the slight honey flavor, but my son and I loved the taste. My daughter isn’t a big watermelon fan, so I just discounted her vote entirely. I think next time I’ll substitute lime juice for lemon juice just because I like the lime flavor better. Also, the recipe could do with more strawberries. But that’s my philosophy on life in general. Next, you’ll probably still have some watermelon left over after you make your popsicles. Making sure it’s all de-seeded, throw it in the food processor or blender pulse it a few times. Then, pour your pureed watermelon into an ice cube tray or two. Cover them with plastic wrap, stick them in the freezer, and pull out as many as you need at a time to make fruit smoothies on those hot summer days when the thought of actual food is unbearable. (Note: make sure you add some yogurt to your smoothie, or you’ll be hungry within minutes of consuming it). Finally, if you still have watermelon, dice it up even smaller than you did before and sprinkle it with a tiny bit of sugar. Put it in an airtight container and the next time you hear that guilty voice in your mind saying “You should really be buying plain Greek yogurt instead of that sweetened stuff,” you can say, “Yes, you’re right!” Then you can go home and mix your sweet watermelon and watermelon juice (thank you, tiny bit of sugar) into your yogurt and you actually enjoy that yogurt. Can you tell I’m not a big fan of Greek yogurt? But I know it’s extra good for me, so I put in smoothies and other stuff whenever I can bring myself to buy it at the store. Seriously, the watermelon helps. There are also lots of recipes for Watermelon Gazpacho/Cold Soup out there. 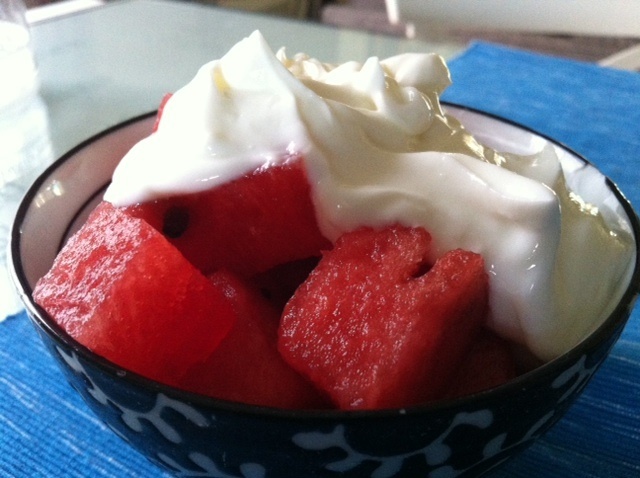 I am not very fond of foods that have no crunch or chew to them (exception: ice cream), so that watermelon food idea doesn’t appeal to me. But if you find a good recipe for it, let me know; I might be brave enough to try it! So, now you can go to the grocery store and wrangle that watermelon into your shopping cart with the peace of mind that you will actually use the entire thing. Pick one up for me while you’re at it.